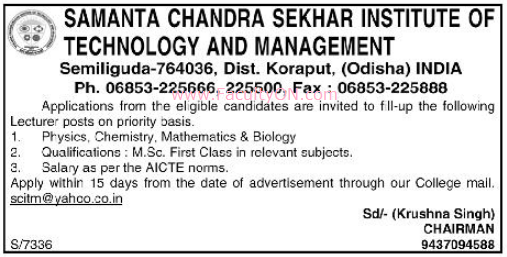 Samanta Chandra Sekhar Institute of Technology and Management, Koraput has advertised for the recruitment of Teaching Faculty- Lecturers jobs vacancies. Interested and eligible job aspirants are requested to apply within 15 days from 23rd November 2018. Check out further more details below. About College: Samanta Chandra Sekhar Institute of Technology and Management is one of the premier technical institute in south Orissa.It was started in the year 2001. To achieve this enhancement and enrichment, the Institute has astute administrators, reputed professionals, philanthropic businessmen, committed social workers and visionary academicians at the helm of its affairs. It is located at 3kms from Sunabeda in picturesque surroundings and has a cool and salubrious climate. How to Apply: Interested and eligible candidates are requested to send CV along with copies of certificates / mark sheets, copy of Aadhaar card, copy of PAN card and recent PP size photos to the following email address or postal address.